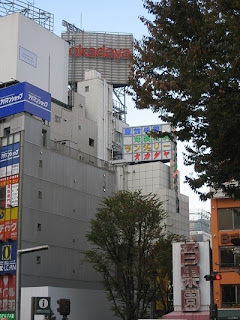 Last time I was in Tokyo I struggled to find Okadaya, despite good directions (this seemed to be a pattern with me). This time I was determined to find it, after reading good things about it. I took a photo of the well signed store (how could I have missed it) so anyone else trying to locate it knows what to spot. This red sign is what to look for when you come out of the East Exit of Shinjuku station. Okadaya is in two buildings - each of about 6 levels. One building contains fabric of all descriptions, the other contains all the extra bits you need to sew, knit, bead, and craft your little heart out with. My favourite floor was the craft book floor (right at the top). I think it had the best craft book selection I'd seen anywhere, with multiple copies of each book. Sadly, there was a "no photos" sign up so I can't show you the proof. For the knitters there was also a whole yarn floor. I spent an evening in Okadaya and planned to return on my last day of our visit to Japan...the family wanted to tag along, and quickly ran out of patience so my purchases limited to just a few pattern books. I thought I would be able to buy online when I returned to Aus. Unfortuenatly their website is only available in Japanese script....what an amazing store! yes I agree!!! best book selection...did you get the lift? because I had a pram I had to wait while the lift went up and down with not enough room for me and plenty of young and pretty people using the lift and not the stairs...grrrrr...oh and its not the flashest part of tokyo! Thanks for the picture! I tried to find Okadaya when I went to Japan last April, but I failed miserably. But there's always next time! I would love to check out the book floor. I couldn't find the craft books in Kinokuniya (where I ended spending my time instead of Okadaya). But I've heard their selection is quite good as well. My friend Mayumi brought me here when I was in Tokyo last summer, it was the best store ever! I could have spent days in there. I bought some fabric, books and yarn. The prices are also really reasonable, considering how much these cost when imported to North America. I don't think I could have found it if I didn't have a guide. The streets in Shinjuku are all criss-crossing and with no street names and flashing signs everywhere, it's pretty hard to find your way. I love this store too and second the opinion that it has the best craft book selection to be found. I'll be making my last trip there in a few weeks! In their building across the alleyway, they have some interesting kits and things to use with fabrics as well. That is sooooo sweet of you! Thank you! I have been to Tokyo 7 times but would you believe not once have I been to this great shop! thanks for the heads up and have a lovely Sunday! Thank you so much. I'm visiting Tokyo in two weeks and this helps a lot. Greetings from Denmark.